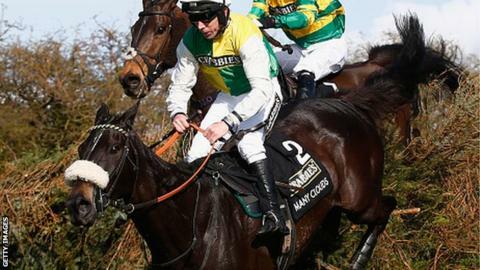 Last year's victor Many Clouds is among 126 entries for the 2016 Grand National at Aintree on 9 April. The 2014 winner Pineau De Re - which, like Many Clouds, was ridden to victory by Leighton Aspell - features in the largest list of entries since 2008. Five of the top six horses from last year's race have been entered - but Monbeg Dude, who finished third, will not have recovered from injury in time. A maximum field of 40 will be selected to start the Liverpool race.